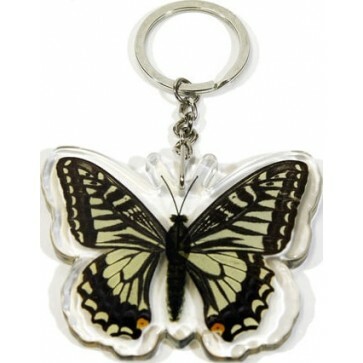 Unique keychain contains REAL Asian Swallowtail Butterfly wings preserved forever in a clear butterfly shaped acrylic. Let your inner lepidopterist out! Size: 2" x 1 1/2". A natural way to appreciate nature up close and without the itch. With its curious swirl of science and style, this unique keychain contains REAL Asian Swallowtail Butterfly wings preserved forever in a clear butterfly shaped acrylic. The body of the butterfly is fake. The wings might be trimmed slightly to fit the holder.